“Red sky at night, shepherd's delight. Red sky in the morning, shepherd's warning”. We have all heard this old saying, it first appeared in the Bible in the Gospel of Matthew, used at sunrise and sunset to indicate the changing weather. Artist’s impression of ULAS J222711-004547. This newly discovered brown dwarf is characterized by an unusually thick layer of clouds, made of mineral dust. 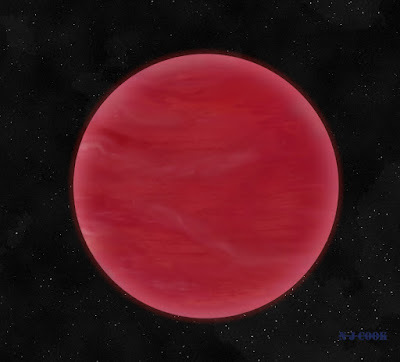 These thick clouds give ULAS J222711-004547 its extremely red colour, distinguishing it from “normal” brown dwarfs. A red sky suggests an atmosphere loaded with dust and moisture particles. If the morning skies are red, it is because clear skies to the east permit the sun to light the undersides of moisture-bearing clouds coming in from the west. Conversely, in order to see red clouds in the evening, sunlight must have a clear path from the west in order to illuminate moisture-bearing clouds moving off to the east. However, there are places with very different atmospheres where the sky is always red. This is the case of the recently discovered brown dwarf known as ULAS J222711-004547. Brown dwarfs are intermediate in mass between “normal” stars, like our Sun, and giant planets, like Jupiter and Saturn - too big to be considered as planets, yet unable to fuse hydrogen in their cores like stars. Sometimes described as failed stars, they do not have an internal source of energy – so they are cold and very faint, and keep on cooling over time. This particular object caught our attention for its extremely red appearance compared to “normal” brown dwarfs. Further observations with the Very Large Telescope (Chile) and the use of an innovative data analysis technique have shown that the reason for its peculiarity is the presence of a very thick layer of clouds in the upper atmosphere of the brown dwarf. Not only have we been able to infer the clouds’ presence but we’ve also been able to estimate the size of the dust grains in the clouds – which are made mostly of mineral dust, like enstatite and corundum. The atmosphere observed in this brown dwarf is hotter than the giant planets of our Solar System (like Jupiter and Saturn) with water vapour, methane and probably some ammonia but it is dominated by clay-sized mineral particles. Getting a good understanding of how such an extreme atmosphere works will help us to better understand the range of atmospheres that can exist. The paper, “The extremely red L dwarf ULAS J222711−004547 - dominated by dust”, is published in the Monthly Notices of the Royal Astronomical Society by Oxford University Press.